Welcome to this week’s Eat Make Grow Blog Hop where you share what you have been eating with your family, growing in your garden or making with all your creative impulses. Eat Make Grow is a collective link party that is shared across three blogs and runs every Thursday-Tuesday. Whichever blog that you choose to link up your post, it will show up on all three sites! Eat Make Grow is a way to share with many people posts about your domestic doings, whether that’s growing veggies, hosting parties, sewing, mixing up cleaning supplies, or trying out a new recipe. We want to learn about it! Every week, we will feature the most popular link, and one chosen by the the host. This week, your host is Marigold. And my choice for this week’s Host’s Pick comes from our very own Miranda of Pocket Pause! I agonized over whether or not it was totally kosher to share my co-host’s link, but in the end I think this project is too fun and too sweet NOT to share. I wanted there to be a way for each invited person to send a special message to both my sister and her son that would last beyond the mailbox and guest list…What if I compiled a stack of banners with a personal blessing/sentiment from all of the invited guests and strung them on a long cord to hang at the shower and ultimately in the nursery? I thought that this was such a cool idea and could be incorporated into any number of special events. Imagine doing this in place of a wedding guest book, or to celebrate a special anniversary. 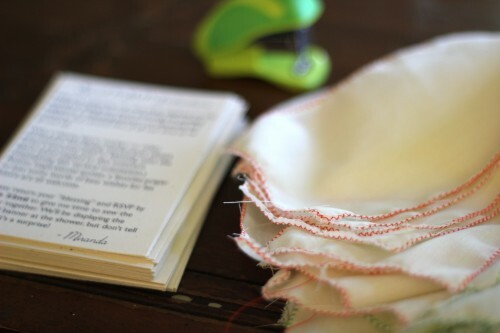 Hop over to Pocket Pause to see how she included the blessing banners in her invitations. She promises to show us more this week! Show us what you’ve done this week!